What is that you see above? The inside of a clock, of course, specifically the inside of the Narco. 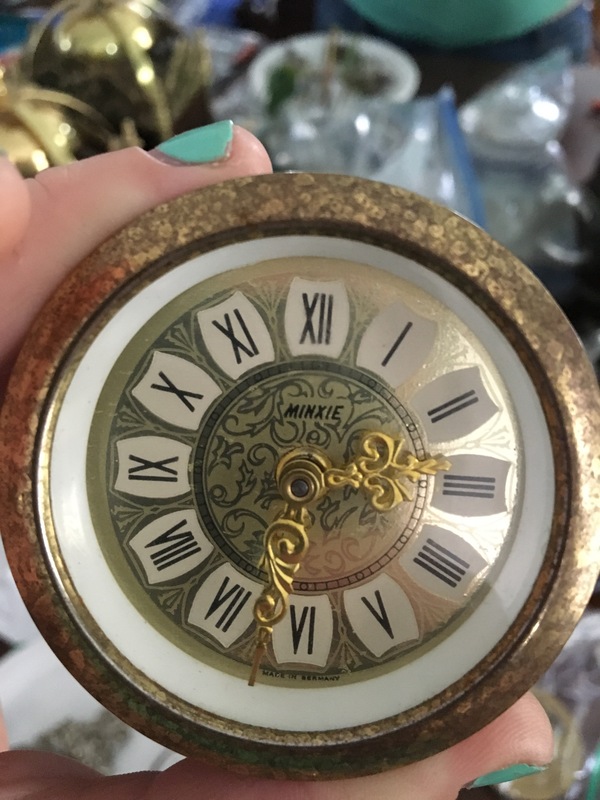 If you recall my post from a few days ago, I postulated that the Narco clock was a knock-off of the Minxie. Both clock dials are shown below. Let’s review what we know about each of them. We know that online I found a picture of the Minxie inside the porcelain that I purchased the Narco in, but that doesn’t conclusively say that one is superior to the other. Even if one is a “knock-off” it could still be better than the original, I suppose. What else do we know about these two clocks? Let’s look at their backs, Narco first. The Narco, top, lists a generic name (“Mercedes”) and says it is a product of the Gebr. Hauser company which existed in West Germany. The Minxie, on the other hand, doesn’t list a company but does specify where in West Germany it was made, which is the epicenter of German clockmaking. It also shows on the very back, below, that it is a product of West Germany. What puts the which-is-more-legitimate question to rest without a doubt is the featured image at the top of this page, which I’ll copy below. Do you see that white inside the Narco clock shown above? It’s a plastic gear, almost identical to what you would find inside a 10 cent Quartz clock (I’m being petty – they may cost at least 15 cents). I advise you check out my recent blog post on balance wheel escapements to see the current status of the Narco clock. Until I find a fix to replace the pins on the balancing piece of the gear, the Narco will have to wait. In all other regards it seems to be in good repair; the spring is winding well, though it could use a sturdier handle to turn with. So what’s happening with the Ansonia clock? Same as above. Everything is in working order and I’m getting very good at taking the spring in and out (see below). The gear that I glued back together is holding strong, though I had to scrape some of the excess glue off of the teeth to keep them clearly defined. (See below). There are a few hangups. First off, the balance wheel wire is hopelessly scrambled. The wheel itself is fine, which is the important part. I need to order or pilfer some of that very thin wire that allows for a slight spring tension. Second, check out the pin at the very bottom of the image two images up. It’s in the center of the image below. In research news, the Ansonia has revealed yet another mystery. Below the silver-colored finish seems to be a gold-colored finish. See image below. The back circle of the clock face, which holds the mechanism in place, feels and looks like steel. It’s the front that has led me to research pewter, tin, britannia, chrome finishing, electroplating, and more. What could that gold color be? The edge between the back and front does seem to be demarcated by a coating on the frame piece. I think it’s time I start looking into silver plating and chrome finishing. Last but definitely not least, the Lux Bluebird Pendulette Clock. Things are looking VERY good in Lux-land. As a reminder, this clock is absolutely, definitely a 1930s Lux Bluebird Pendulette. It has paint chipping and fading but that doesn’t detract from it’s fun and cute look, and its chippy pendulum sounds, which also thankfully seem to be moving at the right speed. I fully wound this clock at 9 PM tonight, so I will check it periodically to see when it winds down. As a matter of fact it was already wound and just not running, which is where I last left it. Why wasn’t it running, you ask? Well first I took it apart and checked the gears. Those were fine, but still not running. I took off the back and it ran a little better but still slowed quickly to a stop. I had it run without the front and that was fun to watch, but again, not very helpful. So when it’s not the gears and it’s not the case and its not the dial and it’s not anything else logical, what did I try? I took the bob off the pendulum, and lo and behold it worked perfectly. I was thinking about maybe the air drag or the weight of the bob messing with the movement of the pendulum. This isn’t Freshman Physics Lab (Kristen, we were great partners!) and this isn’t a coin on a string approximated as a free swinging weight with a massless string. The second moment of inertia of the pendulum and bob is not easy to mathematically determine but I figured changing it would be illuminating, and it was. It seems the pendulum was just slightly off. I put the bob back up but lower, so the pendulum swing is longer. If the clock doesn’t keep near-perfect time I’ll move the bob on the pendulum again, but we’ll wait until tomorrow to see if that’s necessary. So far it looks, surprisingly, very good! In summary: The Lux Bluebird Pendulette clock is working, fingers crossed that it stays that way, and it’s cute and fun to watch. The Ansonia clock looks great but I need to find a few minor fixes for some pins. The Narco clock looks functional but new, with an old-style balance wheel escapement that is giving me a typical problem for balance wheels. All in all, an extremely successful night!